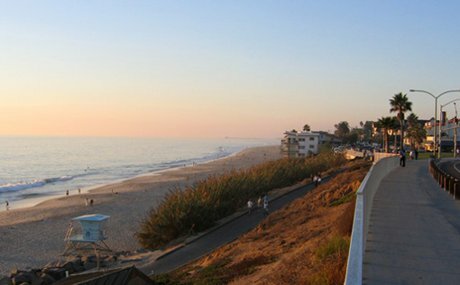 Carlsbad, known by locals as "The Village by the Sea," is located 35 miles north of San Diego on seven miles of pristine beaches. The city is home to world-class resorts, shopping and Legoland theme park. Its well-planned neighborhoods and top-ranked schools make Carlsbad a sought-after community to call home. The weather in Carlsbad can’t be beat, with mild summers and winters, which leaves plenty of opportunities to enjoy the beautiful outdoor amenities – surfing, watching sunsets, swimming, hiking, walking, golfing and exploring. Some of the most popular Carlsbad communities include Bressi Ranch, Aviara, Calavera Hills, La Costa and Rancho Carillo. Aviara, which features views of the ocean, Batiquitos Lagoon and the inland hills, offers homes primarily in Spanish and Mediterranean architectural styles. Gated condos and detached single-family homes are among the options for home buyers. Two schools within the Carlsbad Unified School District – Aviara Oaks Elementary and Aviara Oaks Middle School – are within walking distance of many residents. Nearly 50 percent of the 1,019 acres of Calavera Hills was set aside as open space, including habitat preserves, recreational areas, riparian habitats and natural slopes, trails and parkways. The Calavera Hills Community Park, an 18-acre space shared by residents of the community and surrounding areas, features a community center, gymnasium, softball fields, basketball courts, playgrounds and picnic areas. The community is home to excellent schools in the Carlsbad Unified School District. La Costa may be known for its famous resort and spa, but it’s also an active real estate market with a broad range of housing options, from apartments to condominiums to detached single-family homes. It includes both gated and non-gated neighborhoods, set among rolling hills with amazing views. Rancho Carillo encompasses 18 villages with more than 1,500 residences. The community features natural trails, a swim center and clubhouse, and highly rated schools in the San Marcos Unified School District. The Rancho Carrillo Swim Center, for residents and their guests, includes a year-round heated swimming pool and spa, picnic areas with barbecues, outdoor showers and a furnished clubhouse with a kitchen. Search all homes for sale in Carlsbad. Rancho Carlsbad Country Estates Bldg. The Fairways At La Costa Bldg.